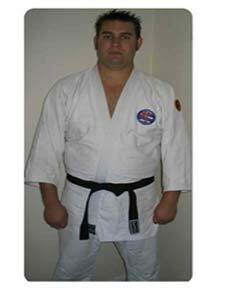 Professor Nicholls has studied the Kodenkan Danzan-Ryu system of Ju-Jitsu for over 30 years. His training began in 1980 with the head of the style, Professor Sigmund Kufferath. This great good fortune of studying with Professor Okazaki’s top student was not lost on Professor Nicholls and his time spent with the late Professor Kufferath developed well beyond the student teacher relationship into a profound and enduring friendship. The teaching style of Professor Kufferath changed greatly over the years, moving naturally from an emphasis on waza (utilitarian application) towards kata (emphasizing form) as his years progressed. Yet Professor Kufferath always maintained the importance of a balance between these two facets of the art, insisting that they were mutually dependant and inseparable. Professor Nicholls received his Teaching Certificate of the Kodenkan from Professor Kufferath, having studied and shown sufficient ability in the Okugi, or “hidden techniques”, an oral tradition passed down from teacher to student, comprising the most advanced repertoire of the system. When Professor Kufferath insisted Professor Nicholls open the first Kodenkan dojo in Britain, he passed on this great responsibility with his blessing. Shortly after this great honour was bestowed, Professor Nicholls was made The British and European Director of the Kilohana Martial Arts Society, a title he holds in the highest degree. In addition to the invaluable guidance of Professor Kufferath, Professor Nicholls has studied with such masters as Sifu John Chow Hoon, Sensei Wally Jay and Sensei Walter Todd, to name a few. He has received extensive tuition from Sensei Jack Carter in the art of Seifuku-jitsu. While having the privilege of receiving the rank of Nidan in Kempo-Jitsu from Shihan Russ Rhodes and holding lesser ranks in Shotokan-Karate and Aikido. Professor Nicholls remains ostensibly a ju-jitsuka, always striving to better understanding and achieve the deepest principals imparted by the Kodenkan Danzan-Ryu. Sensei Irwin started his training at age 8 when he started to attend the Judo club opposite his home. Over the years he trained under many different instructors, in many different styles including Judo, Jitsu Foundation (Ju-Jitsu), and to much lesser degrees Shaolin Kung Fu, Tai Chi, Dung Sai Do, Karate and Aikido. Going for years at a time without any formal training but always drifting back to the martial arts. In 1999 Sensei Irwin moved to London and after a chance encounter with Professor Nicholls in a martial arts shop, he began his training in Kodenkan Danzan Ryu Ju-Jitsu, this resulted in 2005 in Sensei Nicholls asking him to organise a training group which was to become Tetsu Tori Dojo (Gatwick). Sensei Stephen ‘Skippy’ Cooper began his journey in Kodenkan Dan Zan Ryu Ju-jitsu in August 2002 shortly after he relocated to the UK. Upon being exposed to the efficiency and effectiveness of the system though Professor Stephen Nicholls, Sensei Cooper committed himself to the system and has been dedicated ever since. Currently Sensei Cooper holds the rank of Sandan (3rd degree black belt) in the Kodenkan Dan Zan Ryu system of Martial Arts. Kodenkan Dan Zan Ryu is not only a martial system but it includes a healing art called Seifuku-jitsu of which Sensei Cooper is a competent practioner. Prior to studying DanZan Ryu Ju-jitsu Sensei Cooper’s interest in the Martial arts extends back beyond 1992 when he first started training in Zen Do Kai Freestyle Karate and BJC Muay Thai Kick Boxing with Gary Sinclair where he achieved black belt levels in both. His thirst for Martial Arts knowledge extended beyond the systems mentioned to a variety of different styles include Tokon Ryu Ju-jitsu, BJJ and Inayan Eskrima of particular mention. Throughout the 90’s and early 00’s Sensei Cooper was involved in the security industry in Australia working a variety of sectors from large stage band security through to night club security and personal protection. This provided a very practical base for his future knowledge and influencing the way he teaches today. Sensei Cooper has been a constant travelling companion with Professor Nicholls over many years. Attending and supporting with the Professor and eventually instructing in seminars over several countries such as Spain, Portugal, France, England, Scotland, and across the USA. This exposure introduced him to many very experienced and professional martial artists which continue to provide influence with him today. 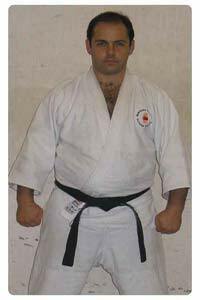 Sensei has held posts within the Kilohana Europe organisation, namely Director and Secretary as part of his way to influencing the growth of the martial arts community. In 2010 Sensei Cooper started his first Dan Zan Ryu Training Group in Sipson village hall Heathrow to share his knowledge and passion of Martial Arts. Since then he has move his teaching to open Ryuuseigun- Dojo in Winnersh where he works with all ages from 4/5 year olds through to adults. Sensei Cooper also has a keen interest in women’s self-defence which he also conducts regular short courses in. Copyright © 2006-2019, British Kodenkan. All rights reserved.